Scamsters are cashing in on Digital India drive by Prime Minister Narendra Modi, more aggressively post demonetisation scheme by creating fake mobile recharge and government websites carrying name and picture of Modi and circulating the malicious link on social media platforms. These links are claiming to offer free recharge, increasing withdrawal and deposit bank limits after taking all the banking and personal details. Also Read: JIO : फ्री सेवा 31 मार्च से आगे बढ़ाई जा सकती है? Security agencies claimed that indepth investigation revealed that the criminals are taking advantage of transition to digital payment by giving lucrative offers. There are dozens of dubious websites and apps functional, which have mushroomed recently to dupe people. "We have received complaints that a link of a website carrying name and picture of the prime minister was circulated which asked the user to recharge their mobile phone by `500-1,000 and in return their telecom company will recharge it by double the amount. It also said this recharge offer is part of PM's latest scheme. Once the payment is made the website shows transaction failed but the money gets deducted. So the customer receives no bonus and ends up paying recharge amount to the fake portal," said a senior police officer of cyber cell. Also read: Is Paytm Safe to use? He explained that the amount of recharge is so low that usually people don't turn up to register an FIR but the website successfully makes huge gain. 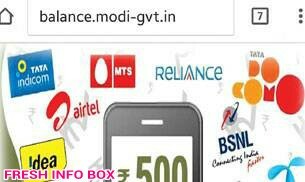 Gullible customer also believes on such links as they are look-alike of government or popular recharge portals. People fall prey to such online offers as many online companies have started giving attractive deals as central government is giving a push to digital transaction. Cyber experts claimed on Google Playstore there are several applications which include gaming and photo app which carry name of Modi. These apps are under scanner as these are not Fake NaMo apps in use for fraud owned by any government body or a political party but gains access to contacts and other important features of the phone making it more suspicious. Police explained that recently WhatsApp was flooded with forwarded message, which read, "`500 balance for every Indian. Reforming India. Modiji giving free balance." This message was followed by a link which took the user to a dodgy website. No balance got transferred to any account, and an user just ended up sharing personal details with spammers. The website asked for your details such as phone number, operator and state. The fake website can easily fool anyone with no knowledge of cybercrime as it features logos of all major telecom operators including Idea, Airtel, Vodafone, BSNL, Reliance and Aircel. The website also asks the user to share the link with other contacts. "It is highly advised, that if any user receives such a message, they should immediately delete it so that even by mistake they don't end up tapping on this and forwarding it to their contacts. Such malicious links not only can affect your device, but may also seep into your phone and steal data," said Kisalay Chaudhary, cyber crime expert. "These bogus websites try to appear like an official Government of India website or related to telecom operators to trap gullible customers. Government website are .gov.in or .nic.in but fraud websites are -gov.in or _nic.in which may appear real but do not belong to government. So all people making online transaction should be very alert about the website they are browsing. WhatsApp has been a breeding ground for such activities and spreading malicious links," he said.